Available Dogs | Lulus Locker Rescue Lulu's Locker Rescue | Adopt an Animal Today! Rocket came to Luluâs from an animal control facility in Alabama. We havenât had Rocket very long so we are just getting to know him. He is a very sweet young, 1-ish year old guy. He is very good with other dogs. Overall he is very gentle and quiet but is always ready to play if someone is a willing partner. Rocket is a typical young-adult: Friendly, happy, and willing to learn. Dougie was surrendered to an open admission animal control facility. His family said they could no longer care for him. He had a very large tumor on his front leg. Dougie is a very friendly, super easy guy who has few demands in life. He is being fostered with 4 other dogs ranging from 100lbs to 6lbs. Out of the crew his best bud is the 100lb female pit bull, but he gets along great with everyone. Dougie really loves his foster siblings and relies on their company so we will require that he be adopted into a home with at least one other dog who wants to be his buddy. Dougie is a laid back guy and prefers the calm, relaxed life and will do best in a quieter calm home. Dougie loves everyone and has done great with the children he has met, but we think he will do best with older children who can respect that heâs more of a âhang outâ than ârun around and playâ kind of guy. Dougie does not like to be crated or confined, but thatâs no big deal because heâs totally trustworthy having free roam. The only option to remove Dougieâs very large tumor was to amputate the entire limb. Unfortunately the surgical margins were not clean on the pathology report so any potential adopter needs to be comfortable with the fact that his cancer could return or spread in his body because not all of the cancer cells were able to be removed. Dougie has adjusted well to his tripod life and he gets around great. As he has been healing his foster home has said he has gotten more active and animated. 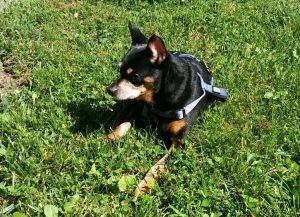 Dougie will need a fenced yard to make his potty breaks easier and an adopter who is able to carry him around as needed. Canelo was rescued from a Chicago shelter. Canelo is 10 years young. When he first went to his foster home, he did not know the joy of snuggling on the couch. That all changed soon! He is a paws up, binge TV watcher with his favorite person. He does have a few stuffies that he drags around, but not really into toys. He prefers small dogs. He has not done well with big dogs. He lives with older children and has met a younger child and did well. He does stay in his crate at night and when his foster mom goes out. He does have accidents so someone who is home more to let him out would be ideal. His favorite thing to do (besides be with his human) is to be outside and go for walks. He is even great about going outside to potty in any type of weather, true Illinois dog! He would love a home where he could spend a lot of his time on his personâs lap being petted. He is a loyal and loving companion. He doesnât even mind being carried like a baby once he knows you! Sugar was an owner surrender to an open admission animal control facility. Just like her name, Sugar and Spice, and everything nice â that is what this girl Sugar is made of. Sweet describes her perfectly. Sugar is a low key, very chill little lady â perfectly content to be the focus of the room. She is happiest in a soft warm bed, or settled in on your lap. She is intrigued by the birds and squirrels outside, and will voice her displeasure if they get too close to the window â she does a great job of scaring them away. She enjoys short walks â a few blocks is fine for her â and she is way too sophisticated to chase a Frisbee. She loves, loves, loves plush toys â she does not rip them apart, but she finds fun in taking each and every one out of the toybox, arranging them âjust soâ on the floor, and then she will lay in the middle of the pile. It makes her happy, so why not? 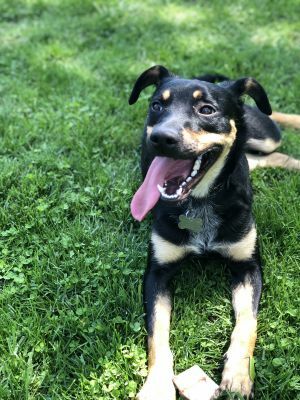 Sheâs got a little spice in her too â she has a specific canine âtypeâ that she is comfortable with â another mellow, calm and laid back dog is her favorite. She does get a bit vocal and uncomfortable with a more energetic dog that is all up in her face and will do her best to let them know of her displeasure. She plays hard to get and does not sleep and snuggle with her foster sisters and brothers, sheâs just happy to be in the same room where all the âactionâ is. She would be perfect in any home setting â she enjoys walking the large suburban backyard, and also enjoys her time indoors. She doesnât require a lot of space, and could be described as more lazy than energetic. She does not run â at all. She trots to grab a toy, and trots if itâs too cold outside, but Iâve never seen her full on run. She is doing really, really well with her housebreaking, but she is still having the occasional accident. She is people and kid super friendly â other dogs would need to respect her space and intro at HER speed. Energetic dogs need not apply. Sugar has a grade 4 heart murmur that will need to be monitored throughout her life. 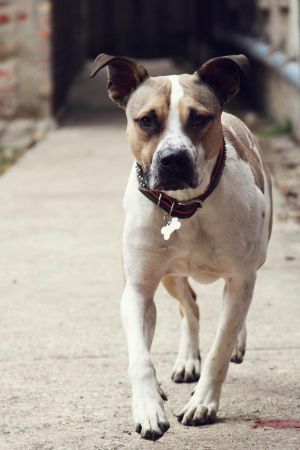 Jason was brought as a stray to a Chicago Animal Control facility. Jason is a low energy dog with simple demands. Jason loves to be with his people and will follow you from room to room. He loves to be pet, but he does not need constant attention, he just wants to be where you are. He loves to sit near you or next to you on the couch, but never asks to sit on your lap. He will cry to be invited onto the bed but then generally chooses to sleep down next to your legs. If youâve been busy all day he will come over and whine a bit for you to scratch his head or rub his belly, but his demands are very temporary and easily fulfilled. Jason has been fostered with two large dogs and has met multiple small dogs. He generally keeps to himself, but every once in a while he gets frisky and tries to engage another dog in play. As is typical with small dogs, Jason likes to feel like he is the boss of the other dogs, so heâll do best with a tolerant buddy. For trying hard to be a tough guy, Jason is actually a sensitive guy who gets his feelings hurt easily. Jason is not a one-person type of dog, but he does like to get to know people before they do more intimate handling with him. Jason REALLY loves the ladies and generally takes to women faster than menâ¦.like...as soon as they walk in the door and talk to him. Jason has gotten use to living in an apartment and doesnât bark much at the coming and going of the neighbors, but he will bark at people and noises outside if the windows are open. Jason is low energy and loves to sleep most of the day, but he is up in a snap if you leave the room or sound like youâre going to do something fun. He likes to be chased around a little bit but once heâs done its back to his bed for a nap, frequently in the âdead possumâ pose. Jason loves to go on walkies and will hop in the car on his own if you leave the door open. Jason has met a kitten and a feisty adult cat. He was very friendly and appropriate with both. He was intrigued by the kitten, but completely disinterested in the adult cat. We are pretty sure he is cat-friendly. Candyâs owner surrendered her during a CRISP (https://www.crispchicago.com/) shift because their landlord decided to no longer allow pets. Introducing Candy: The family pet extraordinaire! She is being fostered with two little girls (2 and 6 years) and she loves them! She likes to be picked up, carried, snuggled, and played with. She even takes it in stride when they get a little wound up and rowdy. Candy is housetrained and always goes potty when brought outside. She is a flexible lady and will also use potty pads when offered to her, which can come in very handy on cold days or when you might be gone a little bit longer. Her foster home does not crate Candy while they are gone and she respects all the household possessions. She does initially whine for a few minutes when they leave, but she quickly settles in and waits for them to return. Candy doesnât seem to be a big fan of other dogs so she should be adopted as an only dog. She does have early-onset cataracts which limit her vision a bit. She goes down stairs a bit more slowly and doesnât see very well in low-light. Candyâs ideal home would have ample time for snuggling. They also should be able to appreciate her super awesome mohawk. 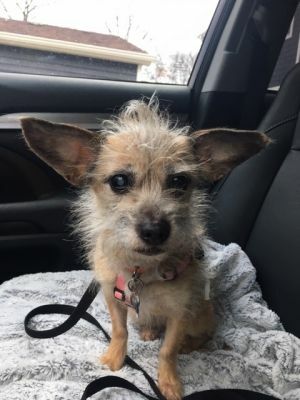 Candyâs foster family is afraid that she might be a Mogwai (from the Gremlins movies), so they suggest never feeding her after midnight. Atlas was a stray brought to an animal control facility on Chicagoâs south side. Due to his fears he was not a candidate for direct adoption. He remained with that organization for 11 months. When Atlas first joined Luluâs Crew he found the world to be very big and kind of scary and preferred to stick close to home. The scariest places were new environments and experiences. Atlas has made some great strides in learning that the world isnât really that scary of a place. One of the biggest things that has helped Atlas feel more comfortable is having a confident dog around for him to watch and mirror. It makes such a remarkable difference that we will require him to be adopted into a home with at least one other dog, but would love if he was adopted into a multiple-dog household. He is great with every dog he has met. His foster home regularly dog-sits and he has been great with big dogs, small dogs, senior dogs, and annoying dogs...you name it, he likes them. He is very passive and never corrects another dog, so he could possibly be bullied by overly assertive dogs. The more dogs around, the more confident and relaxed Atlas is. We feel a fenced yard (of any size) would be best for him, but it isnât a requirement if there is a safe, relatively quiet place for him to go potty. His foster mom regularly takes him on walks and he has made great progress. He is still more comfortable on the quieter side streets. Atlas is happy to have visitors come over but he does need a few minutes to get comfortable with them. Within a few minutes he is sneaking up behind them to steal some sniffs. Within a few more minutes he can only best be described as a âclose-talkerâ as he likes to get awkwardly close to your face and then sniff you all over or stare into your eyes from inches away. Why is this awesome? Because you get to feel velvety soft dog snoot on your face! Atlas loves to snuggle with both people and dogs. He is not being fostered with any children, but we feel he would be appropriate for homes with kids. If they got very loud or rowdy he might remove himself from the situation, but we are sure he would be back snuggling with them once they calmed down. Atlas is the kind of dog that you cannot help but fall in love with once you meet him. He is eternally sweet, and tries so hard to be brave even when he is scared. Barry was dropped off at a vet because they couldnât take care of him. Kingâs owner had been keeping him in their apartment for many many years. The landlord did a surprise visit and realized they had a dog and forced the family to surrender him to a shelter immediately. Despite being blind King is an adventurous guy! When he is introduced to a new space the first thing he wants to do is walk around and investigate. 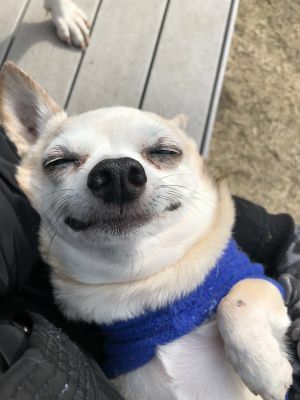 King loves to cuddle and snuggle while in the house, but when he is outside he insists on being set down so that he can walk around and explore the world, he has no fear! King does bark when he canât find anyone but if you call out to him he will quiet up and use his radar-like skills to come find you. He is being fostered with multiple other dogs and he gets along great with everyone and loves to be in the middle of the action. His foster home feels that he would probably do just as well with cats. King lives with a 13 year old boy and they get along great. 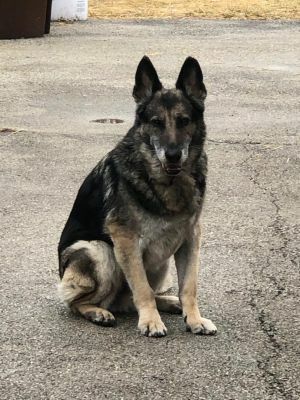 He would probably do best in a home with someone who is home often, or has other friendly, social pets who can stay with him while the people are gone. King has one silly/peculiar behavior: He loves to sleep with JUST his head covered by a blanket! Kingâs foster mom used the following words to describe him: Sweet, Gentle, Nuzzly, Cuddly, Adventurous. 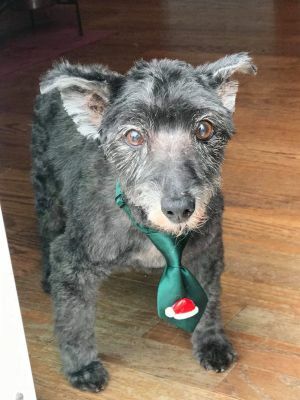 Being 13 years old, King has a few medical conditions that potential adopters should know about. He is currently on the heart medications: Vetmedin, Furosemide, and Enapril, but he is receiving a low dose so this could be increased as time goes on if needed. His vet suggested that 1 year would be the very low end of his prognosis, but she often sees dogs live up to 3 years with his condition. We estimate his monthly medications to be around $80. His general blood work is great for a dog his age and he is still very active. 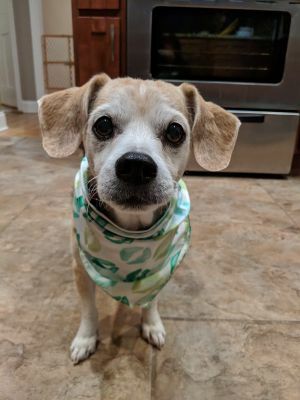 Kingâs foster mom is doing a fantastic job with him and is doing a great job managing his health and is even personally sponsoring his medications and vet visits, but she would love to share the happiness his joy extrudes with a forever home of his own. 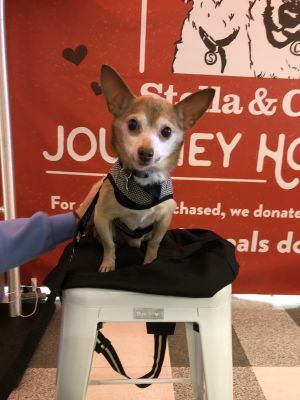 King is looking for an adopter who wants a great, happy, glass-half-full companion, but who has the financial stability to cover his monthly medications.